Hello! Welcome to Day #3 of the Lori Whitlock and Kerri Bradford Last Minute Gifts Blog Party. If you missed the first two days, you should head over to Lori's blog and see the awesome projects you missed. Both of their blogs feature projects each day and giveaways!! My last minute gift idea is for the teacher's on your holiday list. I usually get a book store gift card for my children's teachers so I started with that and created a gift card holder. I wanted to do a mini cube of paper to go with it but I could not find any white paper cubes so I just created the box and stuck an apple in there :) You get the idea, though! Blog Candy: Now for the fun part! Two people who leave a comment on this post will receive a gift. One will receive a $25 gift card to Lori's store and one will receive a $25 gift card to Kerri's store! How fun is that?! Since it is the season of giving........To enter, go to some one's blog on my sidebar and leave them a little love. Pick any one but be sure to let me know that you did this in your comment to be entered! I will pick the two winners on Thursday 8 a.m. est. and post it on my blog! And this week only, everything in Lori's store is 25% off! Just use the code DEC25 at checkout! As a teacher I absolutely love your teacher gift set! Your children's teachers are sooo lucky! 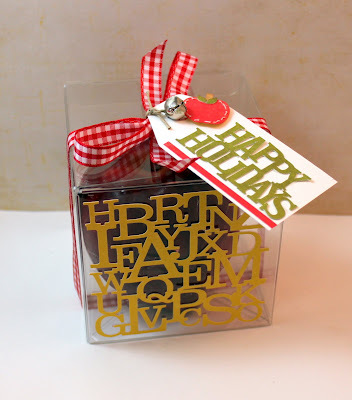 Love the graphic letters on the paper cube holder and the gift card holder is so thoughtful! I visited Natalie Graham and My Graham Crackers. She has some fabulous "giving back" ideas for her advent calendars! Thanks. I left a comment on Joy Dickson's blog about her cute project! So cute! Any teacher would be lucky to receive this as a gift, Thank you for sharing. Love this idea, Carolyn! Fabulous! I left some love for Lori Barnett! What great last minute gift ideas. Thanks so much. I love the teacher set, but then I work in a school so if I had more time, I could make one for everyone! Maybe if I start in January I could get them done for next year! I love your projects, you are very talented, I became a follower. I also went to Beck Beattie to share the love. Love these gift ideas!! Fantastic! Nice way to present a gift card. The paper cube idea is a wonderful idea. I'm defintely going to make this. I left a comment on Lori Barett's blog. You should see her project. I'm sure you have a cut file for this cute mitten ornament. I left a note on NAtalie Graham's page. Loved her ideas for the advent calendar. Can I ask... what did you cut the clear box from? Sooo cute! Very cute. Any teacher would be thrilled to get this gift! I left a comment on ashley newell's blog. Cute project. I also saw a great project, small paper rolled paper wreaths, on Grace Lauer's blog. Love your teacher gift - adorable! I visited Melissa Phillips & posted a comment on her Dec. 5th blog post on her cottages. This teacher gift is such a great idea! Thanks for the inspiration! You projects are always so amazing and they leave me wanting more!!!! Thank you for the constant inspiration! I love the clear box/clear overlay! It looks so finished. I love your projects! I think the notepad would be a wonderful gift, especially in such a sweet box! The gift card holder is great, too! I love your twine bow and the stitching around the apple! Thanks so much for sharing!!! What file did you use for the clear box? Thanks for the inspiration. The projects are great! Thanks for the giveaway! love your gift card holder super cute! I went to Amy Sheffer's blog and left some love on her butterfly card :) Thanks for sharing! I visited Stephanie Serrano's blog. Thanks for sharing your projects. Very neat. This gift set is too cute! Definately a great idea for teachers! Great teacher's gift! I left a comment on Trudy Sjolander's blog--her cupcake tutorial on Dec 6th. I love the box and the card! Its so cute! Thanks for sharing! Great ideas!!! I left a comment on Krissy Clark McKee's blog. What lovely layouts she has!!! Love love love the gift set; I'm a teacher and would be so appreciative of something homemade like this. 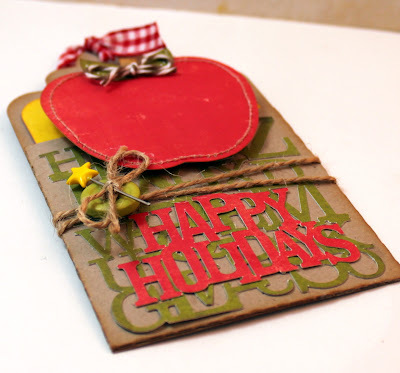 I left some love on Tamara's blog as part of the EP blog hop! :) Thanks for the chance to win. Love Lori's designs. This is turned out so cute! I love the gift card holder and the clear box is fabulous! What a great gift for a teacher, Cammie! You did a wonderful job. I left a little love on Stephanie's blog. Thanks for a chance to win. I'm really enjoying all the great ideas on Lori's blog this week! I left some love for Tammy Edgerton. Thanks. Ok..so I started this earlier today. Started checking out the gal's blogs on your sidebar...got so distracted with seeing all of the great stuff on some of their blogs that I ran into the other blog you are doing and started that hop...then...well.... I am back now. 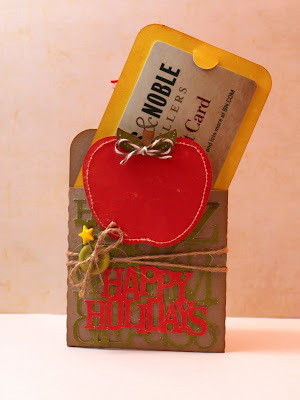 I sent some love to Pam Hooten earlier (dec 01 was her current post)- she has great ideas and a tea cup card to die for! Then I went to Jennifer at Helmar- WOW she has this great tutorial on how to make your own pearl strings and pearl dots! And then Krissy Clark McKee's blog- she has beautiful layouts and this really great File folder album with pockets that she has a tutorial for ( I have to check that out later) and I had to stop hoping around with all of that cause it's late and I am just half way through with this blog hop.... Thank you so much for this challenge!! I found a bunch of talented gals to be incredibly inspired by! Happy Holidays! What a great idea for a teacher's gift. I don't have kids in school anymore but next time I hear someone struggling with an idea for a teacher I'll be sure to direct them here. Your gift card and note paper cube holders are awesome! 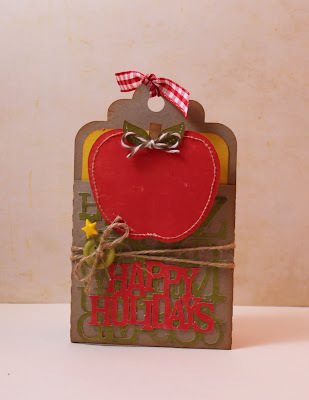 I wandered over to Broni Holcombe blog and gave her some lovin about her gorgeous holiday tag! I'm sure all of the teachers are thrilled with this suggestion for a gift. I've pinned it with a note that it would make a great teacher gift (altered slightly it would make a great gift for and office exchange or boss'es day too). Thanks for sharing your clever idea! UR uber talented!! Thanks for sharing. Left some love on Deb Felts. Thanks for the chance to win. I went to Tamara's blog and left a little love - thanks for the giveaway! Happy Holidays! I visited Kendra's and loved it! i looooooove that you made a teacher gift! SO THOUGHTFUL! thanks for the inspiration! Very cute teacher gift card holder! I love that you thought outside the box and didn't go full on Christmas but utilized the apple for a teacher! Very cute...TFS! I love the teacher gift card holder. I am going to make a few of these for my grandchildren to give as gifts for their teacher. Really cute, thanks for sharing. i love these for teacher's gifts. you ladies have outdone yourselves with all of these projects! I absolutely love the alpha cut - so perfect for a teacher gift! Such a great set - thanks for sharing these cute ideas! I always love visiting Tamara Tripodi's blog! I am in awe how she does all she does with 3 little kids! The Gifts & Premium Dubai trade fair has grown to be one of the highlights in the international giftware business calendar. promotional products dubai - BMIGifts is a worldwide company leading promotional gift items supplier from China serving a large number of major corporations in Dubai, Canada and India. Browse our website www.bmigifts.com for unique promotional gift items or Email us now on info@bmigifts.com.